1. Since I don’t have twenty five sets of measuring spoons and cups, I improvised. I put a popsicle stick into a styrofoam cup. I measured where each measurement hit on the stick and marked it. The kids were told to measure to the “blue line” for a cup, the “red line” for 1/3, etc. That was excellent. 2. I had a tarp underneath the tables to prevent too much mess and disposable tablecloths on the tables. 3. Parents went to the sink to get the water instead of the kids doing that part and potentially spilling on the floor. 4. I had a set of purchased name-brand PlayDoh at the front of the room. I talked about how much it cost ($20) and that the supplies for 25 kids cost just about that for three types of homemade playdough. 5. The mess took FOREVER to clean up and I was so very blessed by my co-worker who pitched in for an hour of clean-up including vacuuming. Overall, a fun and fantastic program. It teaches math skills (measuring), science (chemistry! ), and it gives everyone a great take-home since I let them keep each dough they made! 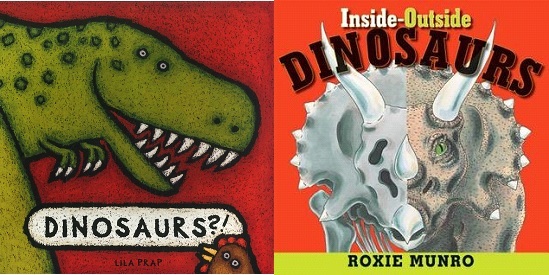 Today’s storytime began with another set of books to introduce our topic for the day: dinosaurs! We had a lot of great conversations during the books. Some of the kids wanted to know whether or not the dinosaurs were meat-eaters or plant-eaters. A lot of the kids were super impressed that I could explain what each dinosaur name meant. (Inside/Outside Dinosaurs translates each dino name!) This also turned into a great teaching lesson for caregivers as I talked to them about how I didn’t read every word/box in “Dinosaurs” but was still able to share a non-fiction book with this age group. 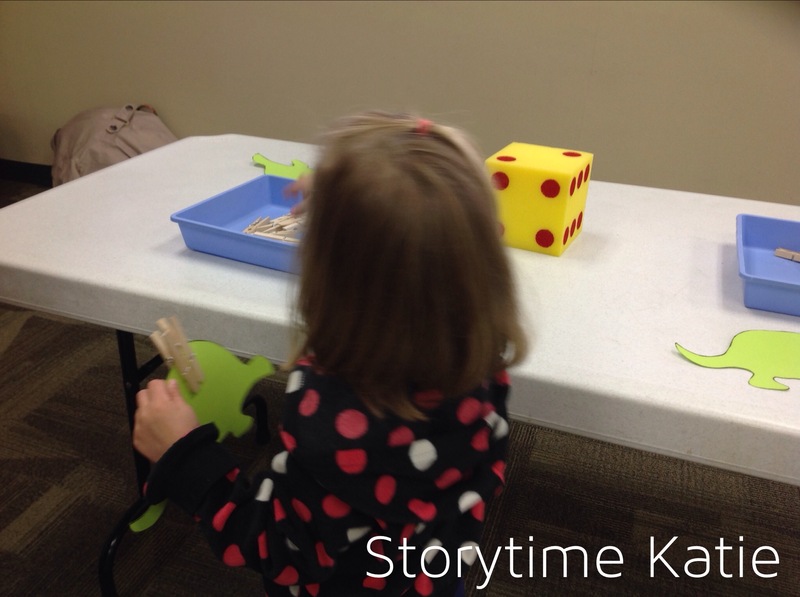 The kids rolled a large foam dice and tried to get all five spikes on their dinosaur. This could have been played as a game between kids, but my kiddos worked collaboratively trying to get everyone’s dinosaur loaded up with spikes. 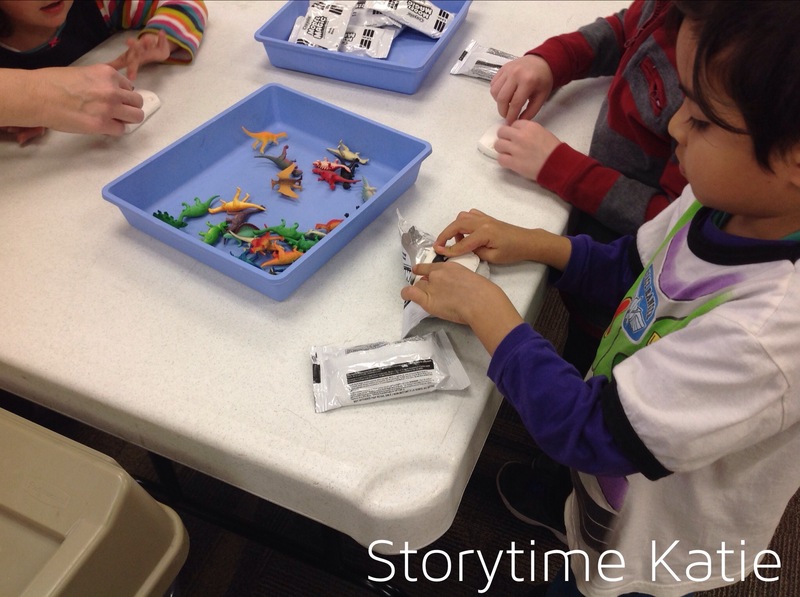 I bought some dinosaurs for the program and had the kids use them at this station to make fossils. We talked about how if they left their Model Magic out to dry that it would harden overnight and feel like a real fossil. A lot of the kids spent a good deal of time here making fossils over and over again. I wanted to have a station that encourage imaginative play and this was an easy solution. Kids also had the chance to work on scissor skills which is something that local teachers have told me is in desperate need *before* children arrive at school. There was lots of great play here with kids chasing their caregivers with their dinosaurs. I drew a rough template of an apatosaur using the American Museum of Natural History’s website as a guide. My footprint was definitely not perfect, but it got the point across. The kids were *amazed* as how big the footprints were. I made some dirt dough/paint using this recipe. I added dinosaur figurines to our play set and the kids went to town. (The library does have smocks which are mostly old summer reading t-shirts.) Most of the kids absolutely loved this station, but I had a few mess-phobic kiddos that made me worry about next week’s all play dough making session. This week, I took the time to focus on the Alphabet. 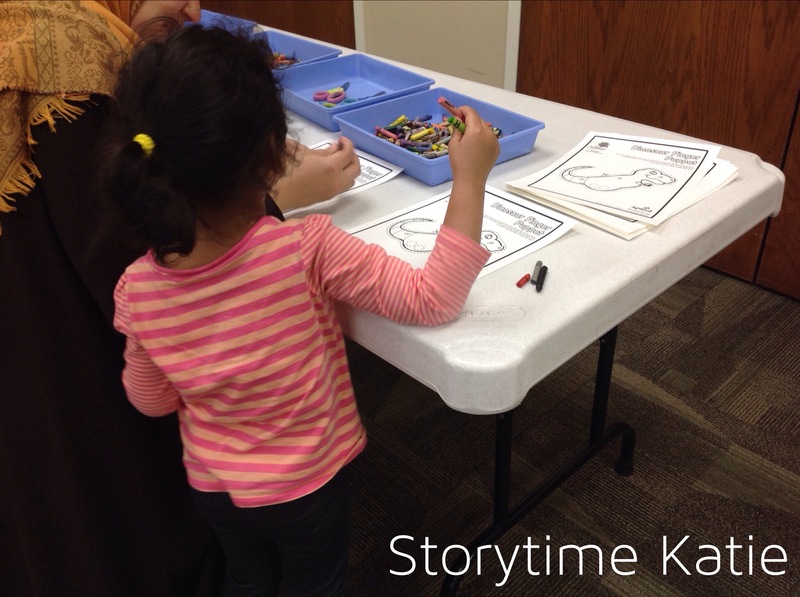 My library gives parents a survey after every storytime session and no matter which storytime program parents are attending, we have constant requests for alphabet identification and practice. 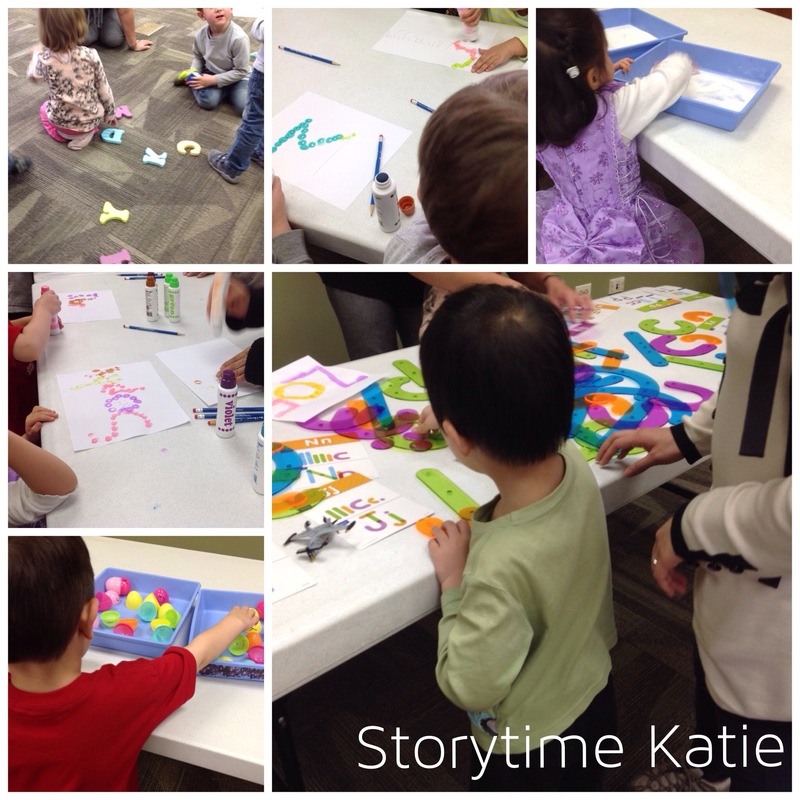 While it’s very difficult to do this in baby/toddler storytime, it was a great opportunity for preschool Discovery!. 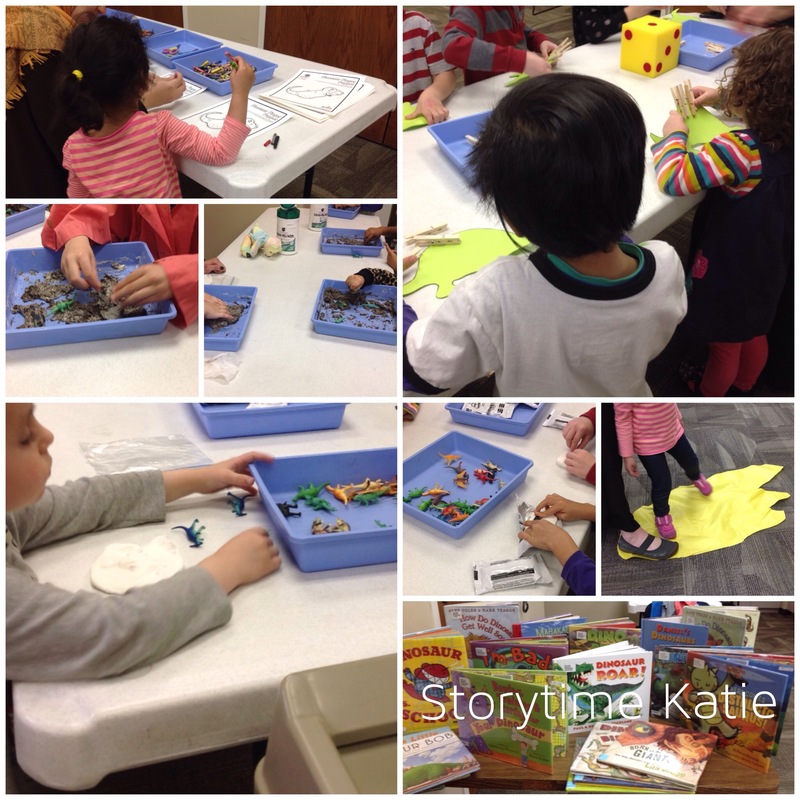 This was another activity station Discovery! and our stations were: salt writing, letter building, lowercase/uppercase eggs, do-a-dot markers, and alphabet identification game. 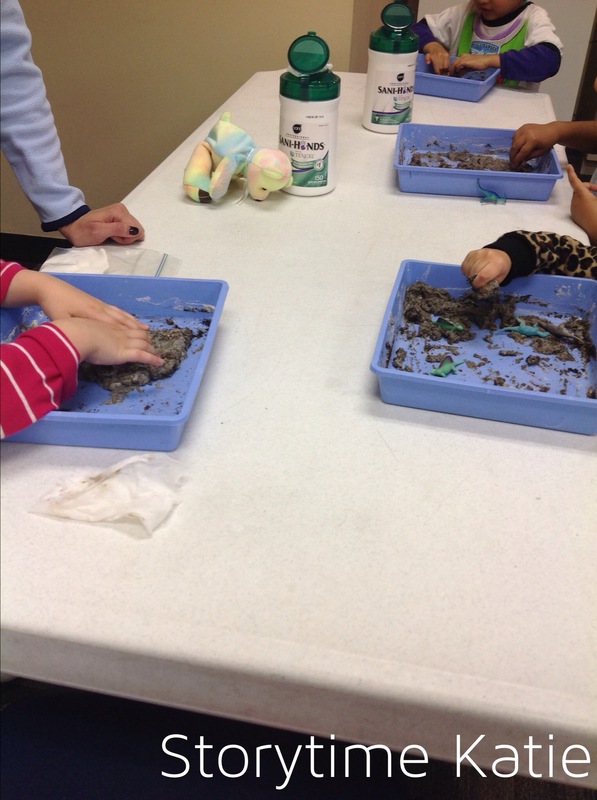 This was a great sensory experience for the kids, but I didn’t see too much actual letter writing take place. Most of the kids were content to draw in the salt. But that let me pass on a great parent tip — shapes are the precursors to letter writing. If your child isn’t ready to start learning letters, work on shapes instead. One of my upcoming Book Bundles has this kit: Letter Construction Activity Kit. I borrowed it for the program. I love that this kit teaches both uppercase and lowercase letters and that it puts some great emphasis on the kinds of lines and shapes we use to create our letters and words. This was definitely the favorite station of the day. I’ve seen this activity on Pinterest since Pinterest started. I bought some eggs at Target immediately after Easter on clearance for $1. I wrote letters on either side of the eggs and let the kids spent the time to match them up. 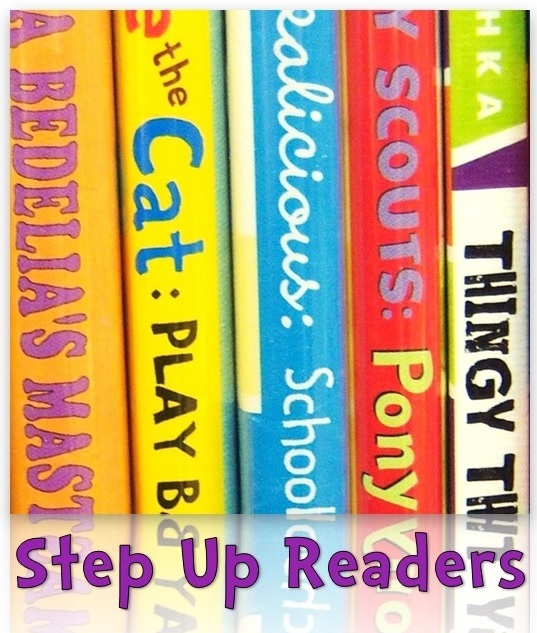 I made sure that no uppercase/lowercase pair were on the same color to up the difficulty for the kids. I had paper available and purchased Do-a-Dot Markers. Caregivers were able to write a particular letter that their child was struggling with for practice. Kids used the markers to trace the letter. This is great fine motor practice and lots of the kids walked away with their whole name stamped on a piece of paper. Easily one of the more popular stations. Since the library has a foam letters set, I tossed them on the ground and used some re-usable dry erase dice to write letters on the sides. Kids rolled the dice and had to find the corresponding letter on the ground. This game worked great in theory. But the dice didn’t work. Either the kids rubbed the letters off of the dice or the dice actually broke (the dry erase part came off the foam body). This was another program that I got a lot of great feedback from and I’m so happy that my community found it useful. Another station activity for this week’s Discovery!. I decided to take the time to focus on building/engineering. 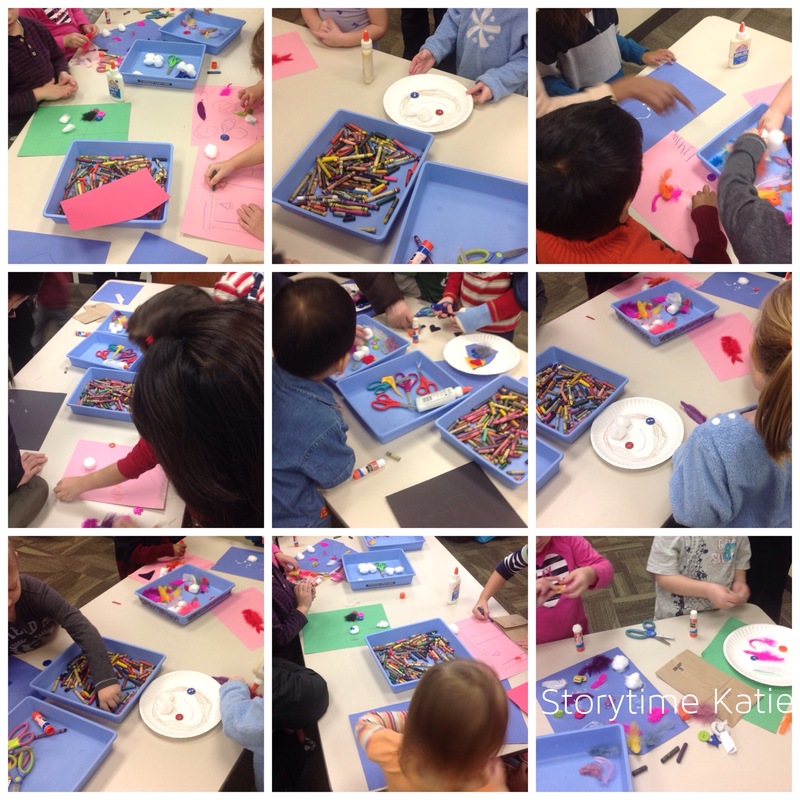 I was really excited for this event since we have so many wonderful building kits and equipment at the library. I put out the following materials: Legos, Duplos, Megablocks, wooden blocks, Castlelogix, Jenga, Gears Gears Gears!, Goldieblocks, playing cards, clay (ModelMagic), Tangrams, and a paper/pencil station. While the kids loved lots of different parts of this program, my favorite part was reading “Dreaming Up” by to them. “Dreaming Up” is one of the Monarch nominees (our state’s K-3rd award) and I had the pleasure of serving on the committee. It was really exciting to share one of our choices with the kids. I had a lot of great feedback from this event. Several of my kids picked a station and stayed there for most of the time. One little boy spent his time mastering the Gears Gears Gears station. Another family spent their time at the pencil/paper station and drew house plans and cotton candy factories. But the biggest hit was the Lego station. 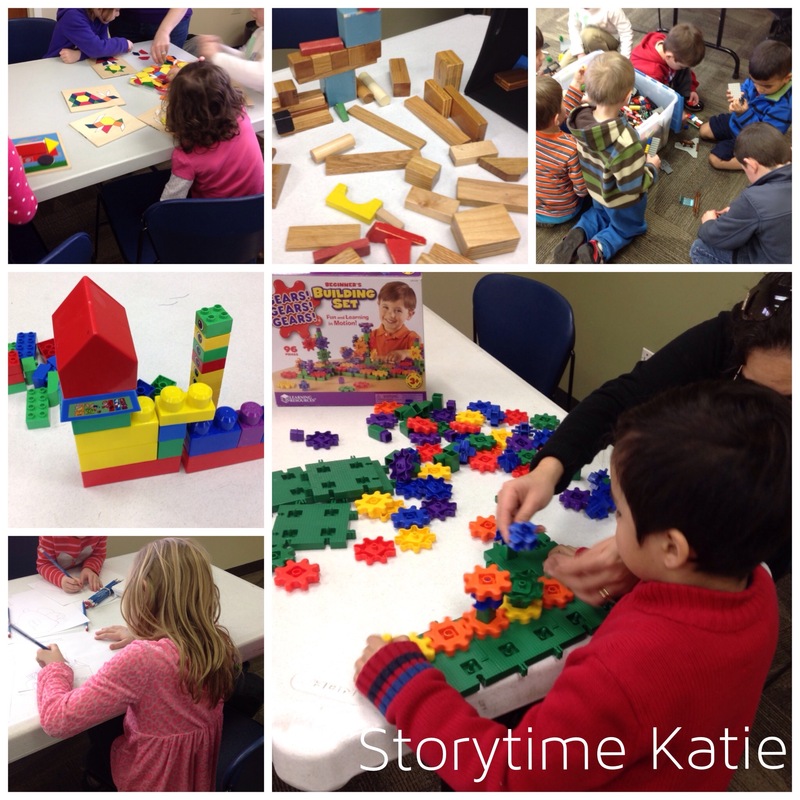 One parent remarked that if the library had an all-day Lego program that the kids would never leave! 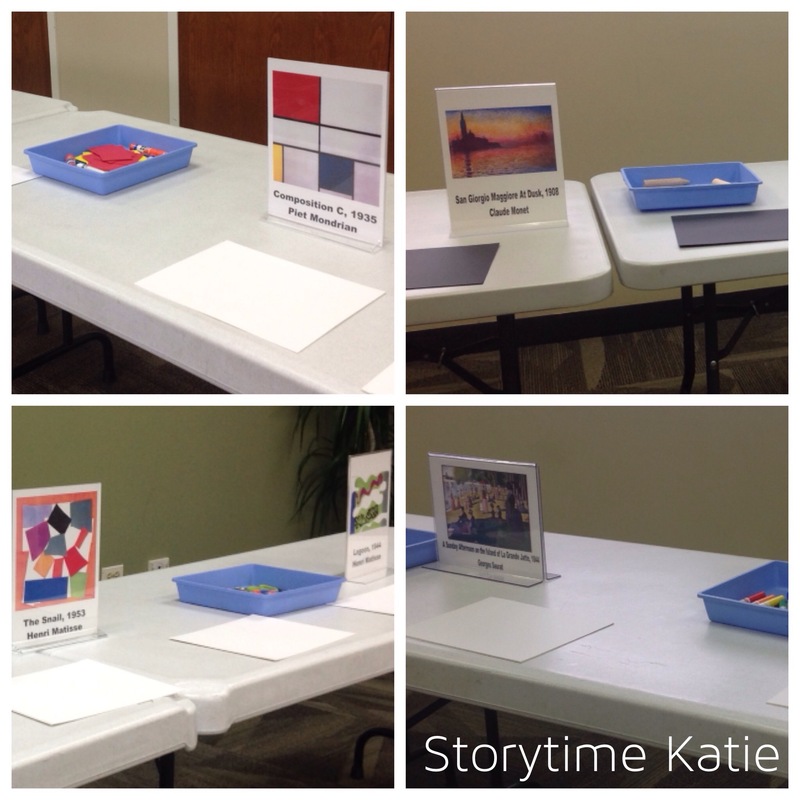 I also want to include an art activity in every session of Discovery!. Last fall, I had an art class that talked about the importance of process art vs. product art. This session, I wanted to spend some time and talk about how all artists started as kids. And that artists create art in different ways. Both books were huge successes with the kids. I absolutely loved reading a non-fiction book for the event and “Henri’s Scissors” was perfect. 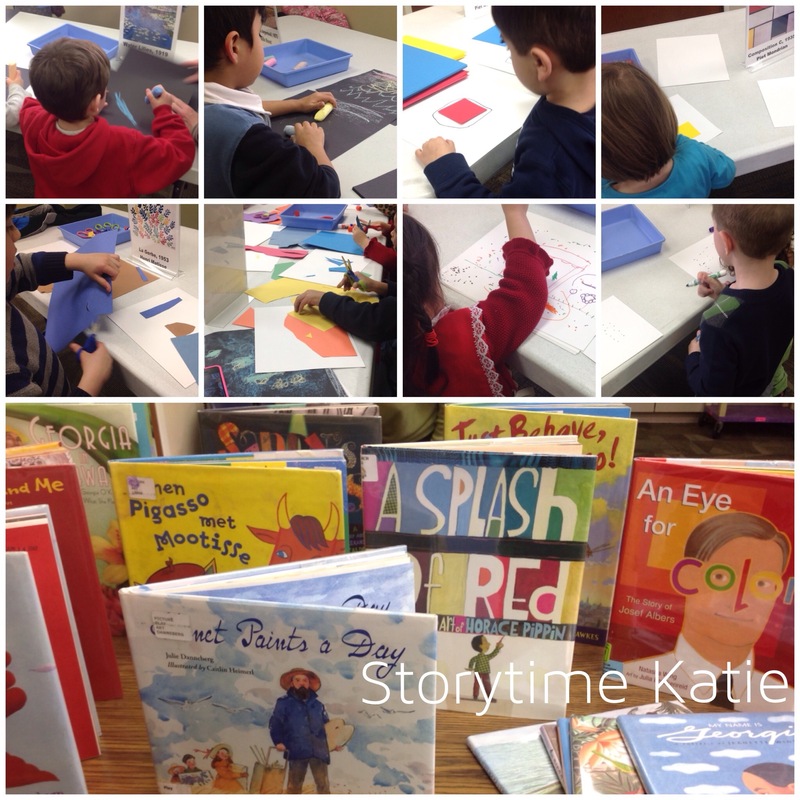 The book naturally led to our table activities. I put out images of each artist along with the accompanying materials. I made sure to tell caregivers that the point of this class was to try different art techniques and not to make a masterpiece. Henri Matisse: I put out colored paper and scissors and let the kids go to town. Georges Seurat: I put out white paper and markers for the kids to practice pointillism. Piet Mondrian: I had pre-cut blue, yellow, and red squares and added black markers to the table. Claude Monet: I took some black paper and sidewalk chalk and let the kids go to town. The kids spent the most amount of time at the Matisse table and the Mondrian table. They had such a good time and I had so many compliments from parents about the ideas presented. And a true librarian victory: my book display was completely gone by the end of the program. 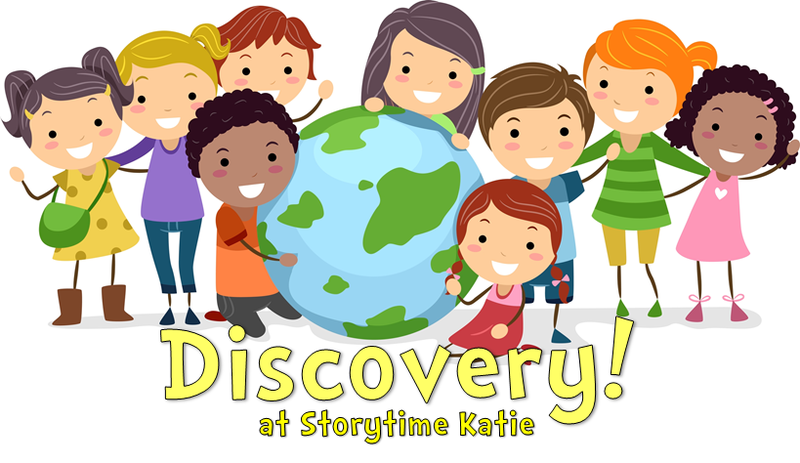 For this spring session of “Discovery!”, we switched to a 30-45 minute format instead of the hour long program it had been in the fall. This worked so much better for our families! I wanted to start off the session with another icebreaker type of activity so that the kids would become familiar with me and be cool with the harder/more complicated things we might try in the future. 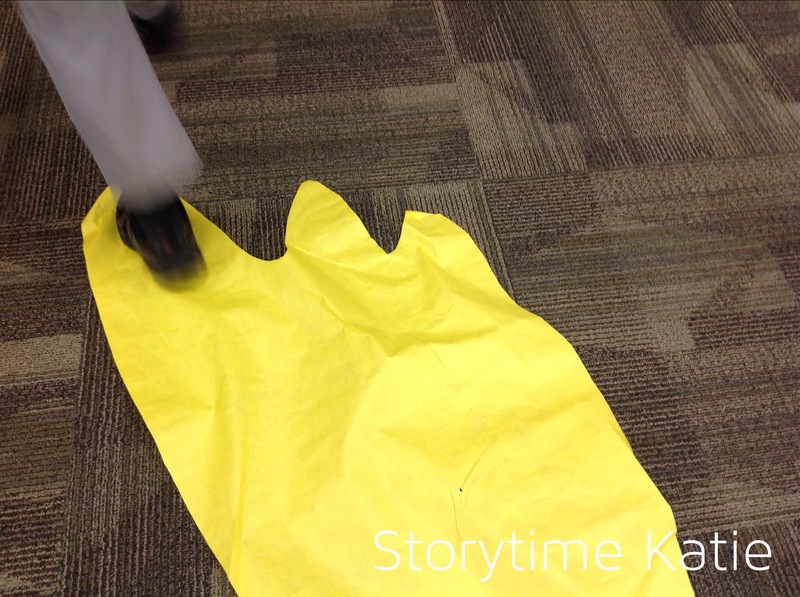 Instead of doing the parachute as an icebreaker (I did use it later on in the session! ), I went with a throwback game session so that parents would also have some fun with me. 1. “Follow the Leader” I played this in a slightly modified version where each child got to tell us what they wanted the group to do. Instead of having the child led the line, we just stayed in our group bunch. Most of the kids decided that we should jump, so be prepared for that possibility. 2. “Red Light, Green Light” I had the kids line up against the wall of our meeting room and stood at the other end. I turned my back to them and called “Green Light” while they all raced towards me. I shouted “Red Light” and turned around quickly to catch any kiddos that didn’t freeze in time. Since I was playing with preschoolers, we did not play for “winners” in any of the games and just played for fun. So as far as the kids know, none of these games have a winner. 3. “Musical Cushions” I wasn’t about to use chairs with preschoolers since that seemed like a recipe for disaster. As each child was knocked out, I let them control the CD player for the next round. Most of the kids decided that the best part of the day was when they got to push the CD player buttons! 4. “Duck, Duck Goose” This is where having parents help the kids was imperative, otherwise they all tried to run at the same time to chase the runner. I spent most of this game running with the “goose” to help them around the circle. Again, we didn’t play for winners, so no one was taken out by the game. And that was it! I had a few other games in my head (Mother, May I? & Simon Says) but we were running short on time anyways. And I didn’t take any pictures since I was very busy facilitating the whole ordeal, but I sure had fun. This was my simplest Discovery! program for good reason: it was the end of the session and I had two presentations during the month of November to prepare for. I purposely planned the most intense programming towards the beginning when my energy would be up. The kids loved the book selections. A few of my boys were excellent at color identification and color mixing. During “Mouse Paint”, they proclaimed loudly, “Those are the PRIMARY colors and those are the SECONDARY colors.” (Librarian pride!) I had several parents and caregivers compliment me on giving the kids the freedom to explore these materials without providing a sample. Overall, while this was a shorter program (about forty-five minutes instead of an hour), this was also a huge success in my book. Yep. I did yoga with PRESCHOOLERS. I broke up the day into Intro, Animal Poses, Shape Poses, and Cool-Down. I began class by telling the kids that we were going to do some yoga, which is a form of movement. I asked parents and caregivers to participate as best they could. I also said that the kids could opt out of any pose that they didn’t want to do. If they wanted to take a rest, they could sit cross-legged while the rest of us were in pose. Then, we practiced taking some deep breaths all the way from our bellies. I had the kids touch their stomachs to feel if their stomach moved. If their stomach was moving, they were breathing deep enough. 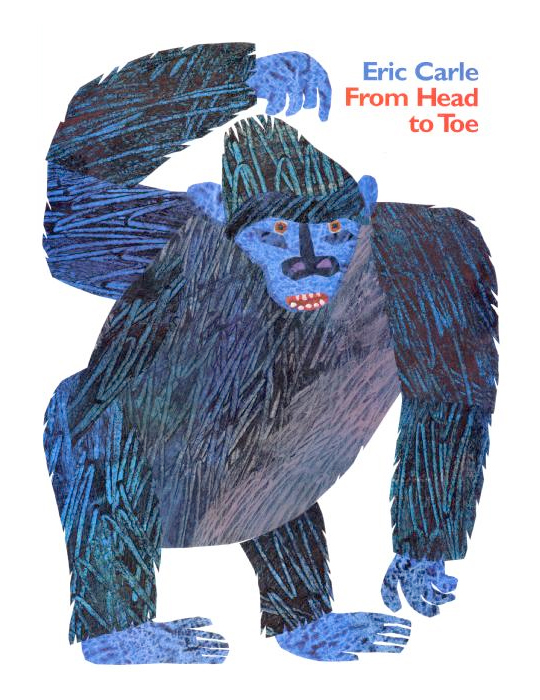 I started with “From Head to Toe” because it’s a great book about movement and getting kids to think about their bodies standing in for animals. I thought this would be a great way to kick off yoga poses and would also work with the plethora of animal poses available to teach! I wanted, again, to introduce a concept to the kids that we would then mirror with our bodies. 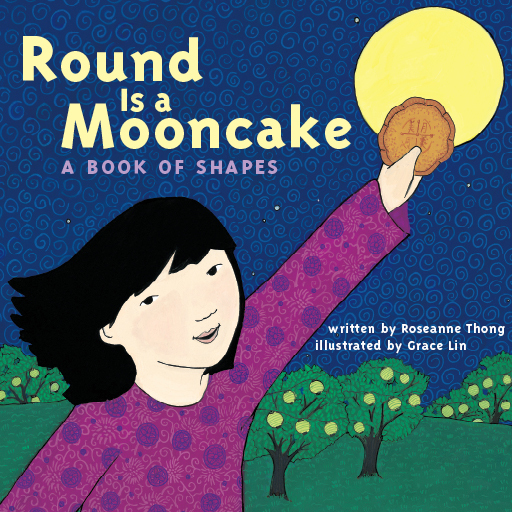 This is one of my favorite shape books ever. While there aren’t as many shape poses, I think the kids really responded to this section because the shapes were easier to see in their friends than the animals. A trillion thanks to Laura for the amazing idea of using Beanie Babies to help the kids practice their deep breathing in a cool-down. I used bean bags since the library does not own Beanie Babies. Since they did such an amazing job being still and calm, I put on some music and let them end with a dance party. Some kids left right away, others stayed for about fifteen minutes to dance with me! Preschoolers + YOGA. (Yes, it really happened!) Some tips that worked for my kiddos was counting out loud five breaths while we were in poses. I kept my voice low and calm to keep up the relaxation going on. Our meeting room has a dimmer installed on some of the lights, so I did use low-level lighting which also helped. Since the meeting room is carpeted, I did not ask parents/caregivers to bring towels or mats. Before we started, I had each child make sure they were three carpet squares away from their friends so we didn’t have any crash landings! I had so many compliments from caregivers and parents. And one Twitter friend said I should apply for sainthood, haha!